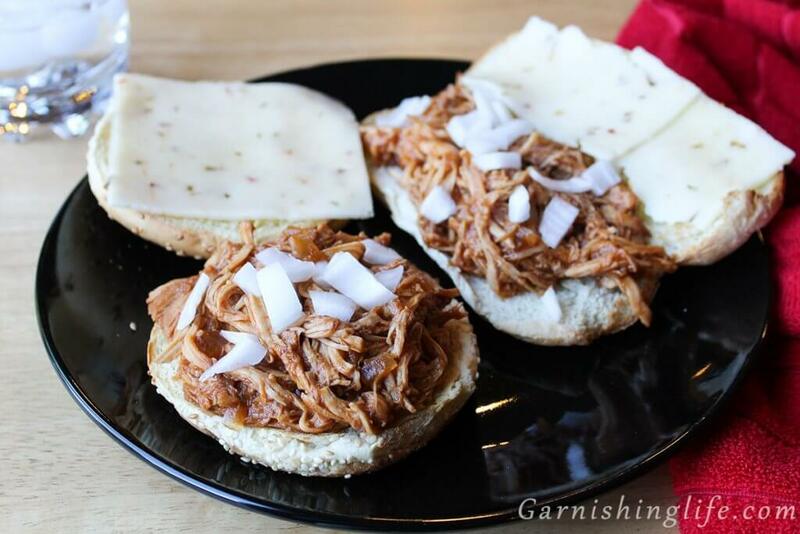 These Slow Cooker BBQ Chicken sandwiches have become a staple in our house since we discovered this recipe. Admittedly, this is not a Garnishing Life original, but it is a huge favorite. Through our years making this recipe we have made a handful of changes and I will offer those here. 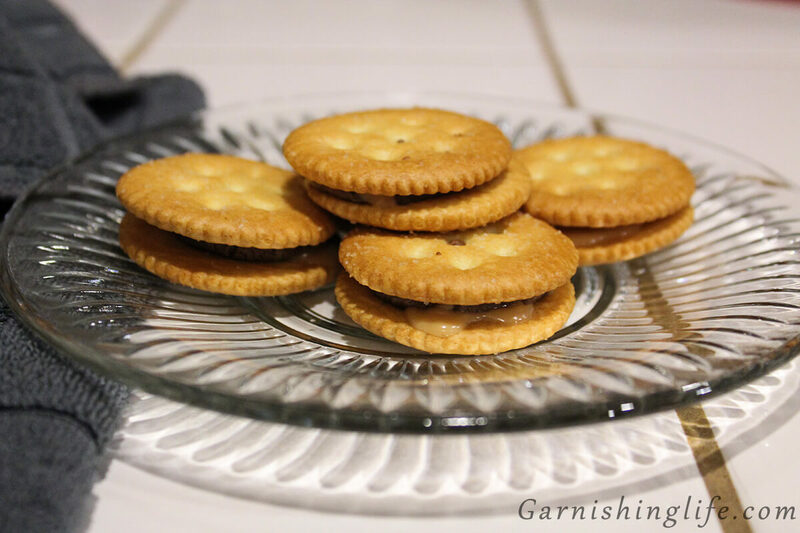 One big reason these are a favorite is the simplicity in the recipe, but the awesome end result. It’s pretty much set it and forget it. The big key is your choice in sauce. The barbeque sauce really makes or breaks this recipe. When it’s my choice I usually go with one of the flavor varieties of the Jack Daniels sauces, however, I’ve used flavors from Kraft, Sweet Baby Ray’s and Bulls-Eye. Crys usually likes it a little sweeter, so we’ve done a couple of versions of the “Hickory and Brown Sugar” flavor, and that’s what we chose this time around. 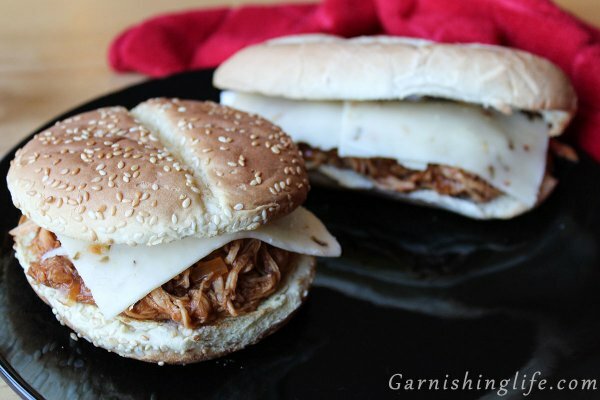 I’ve seen other, similar recipes, that call for brown sugar or Worcestershire sauce, and I don’t think they’re needed to still accomplish an amazing sandwich. I personally don’t really like my barbeque too sweet, so I skip the brown sugar. The construction is pretty simple. You put all your ingredients in the crockpot and let it go. A couple of things that I like to do, when I don’t have to account for the different tastes in the house, are spicing it up with some diced jalapeno, or mixing up the sauce flavors (I like the heat). 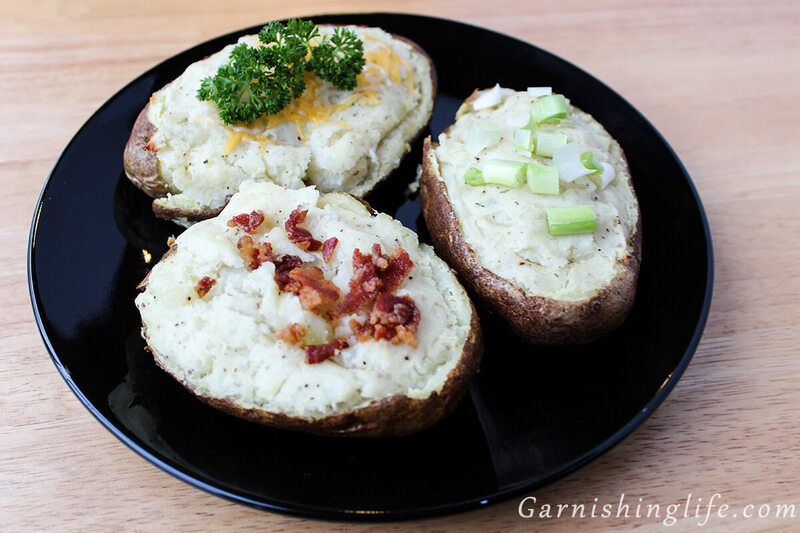 Other possible customizations include the type of bread or roll it’s served on, toppings, and cheese! I like mine topped with onion, cilantro and pepper jack on a french roll. Crys can’t really handle all that flavor so she just sticks with the pepper jack and a standard hamburger bun. Really, anyway you build it, this chicken works well and it makes a lot. This is great for a large family, or if you’re like us, use the leftovers for a lot of lunches. Also, this recipe easily scales to however large or small of a final batch you’d like to make, just make sure if you go larger to account for it in the sauce to keep the chicken covered. 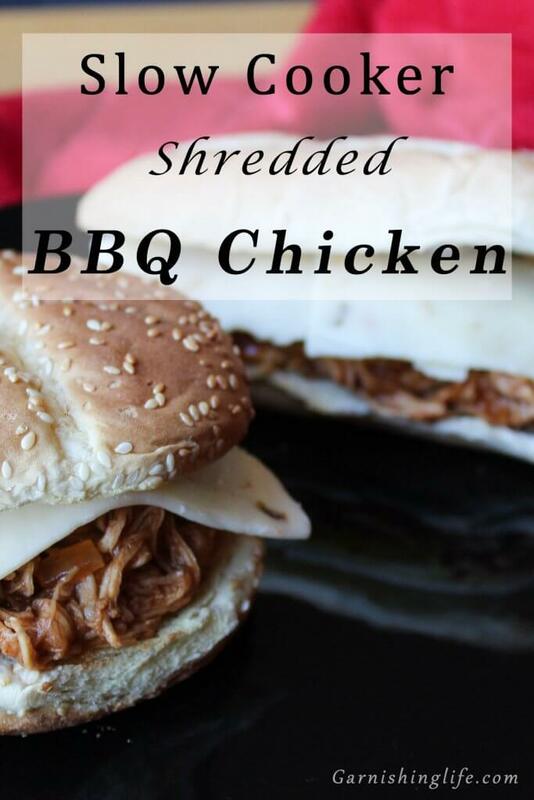 Once it’s cooked long enough to tender up the chicken, you can either shred it in the crockpot, or pull it out to a cutting board, shred, then return to the crockpot. One year on Prime Day I picked up these Bear Paws. They are super helpful for shredding all types of meats. 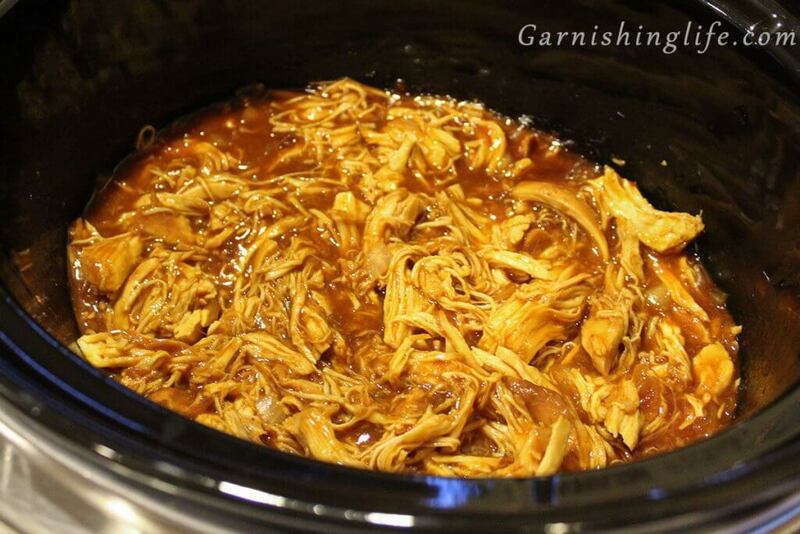 After the shredding is done and you’ve returned the chicken to the crockpot, give it a good stir and let it cook together for about another half hour. 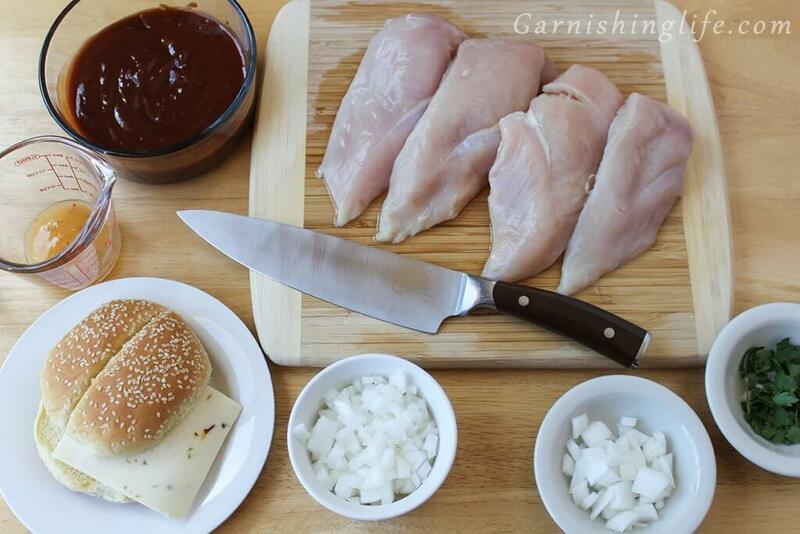 Now you’re ready to prepare and plate it however you choose, but of course, don’t forget your Garnish. 1/8th Cup Italian Dressing approximately. More or less to taste. 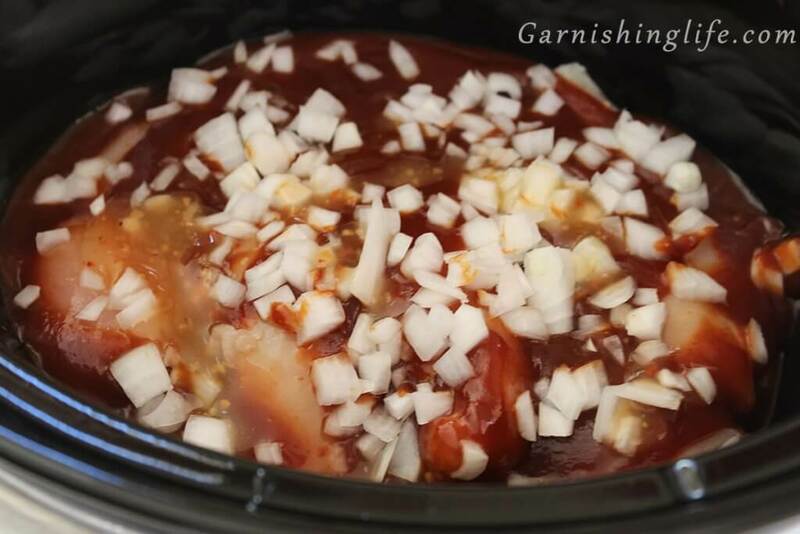 Top with bbq sauce, dressing, and onion. Brown Sugar, Worcestershire Sauce, Jalapeno.